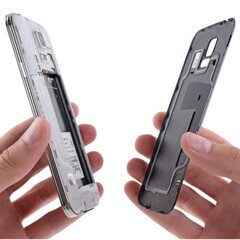 It’s not the first time when we see the new Samsung Galaxy S5 being disassembled. However, this time the teardown was done by iFixit - which, as you may know, gives repairability scores to all the new hot devices that it’s testing. Compared to last year’s Galaxy S4, the S5 is harder to repair. But that isn’t surprising, since the new smartphone is dust and water resistant. The S4 scored 8 out of 10 on the repairability scale in 2013, and now iFixit gave the Galaxy S5 a 5 out of 10.